MooMama: It's SewMamaSew's May Giveaway Day! It's SewMamaSew's May Giveaway Day! It's May Giveaway Day over at SewMamaSew and I decided to be one of the over 250 participants this year! And...what better way to C E L E B R A T E than with a felt banner stating that exact sentiment! I created this "Celebrate" banner using recycled felt and cotton fabrics. There are also little red heart buttons glued to the center of the stars. 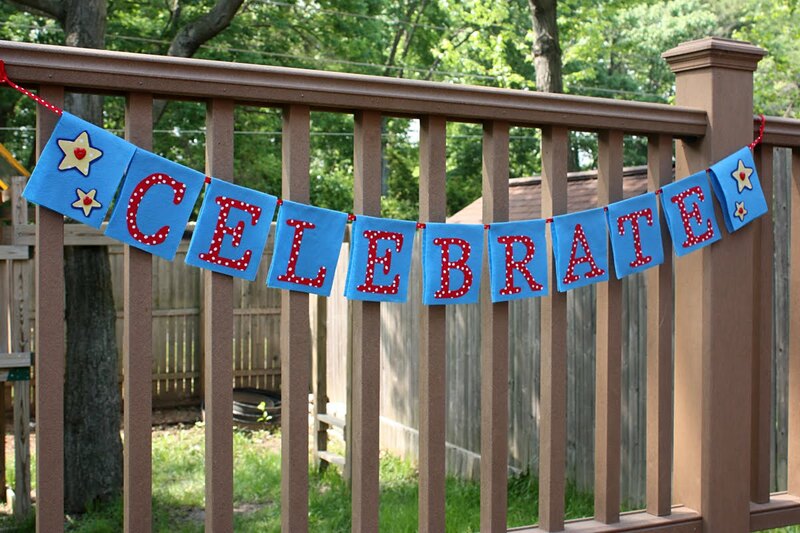 Included is a red polka dot ribbon long enough to hang your new banner and an extra dose of fun with a set of my kindness cards! If you could create a new holiday in which to celebrate your most favorite of things, what would it be? For example, I would celebrate "All-Girl Road Trips, Surprise Gifts, and Mid-afternoon Naps". And what is a good celebration without more than one door prize?! I have TWO of these banners to giveaway!! 100 Fun, Frugal Things to Do with your kids this summer! With 5 girls in the house and the youngest being twins, there's always something new happening! Speaking of the twins, read our Twin Home birth story! And how crafting goes down in a house full of little girls! Pick me, pick me! I would celebrate nightly chocolate chip cookies and milk before bed! I would make a holiday that throws a wedding shower for those who have stuck it out and stayed married for 15yrs. How cool would it be to have beautiful new stuff after all has been ruined. I don't think I have 1 matching glass in my cabinet! On a less selfish note - I think we should have 1 day a week that nothing is allowed to be open/scheduled except the emergent things (hospitals, etc.). It used to be Sundays. Cute! A holiday that celebrates family. Not just moms or dads, but the whole family. I would love to have some sort of holiday where all adults had to be like kids for the day...play in treehouses and sandboxes...eat ice cream cones and candy for breakfast..wear pink sneakers and jeans with a sesame st. t shirt..those sorts of things. your banner is so great! and the whole blog. i am adding you to my bloglines! what a wonderful giveaway! i'd love to win. A holiday celebrating children graduation from grade to grade. Thanks for such a great giveaway, I love the banner! Cute banner! I would make a national knitting day where all knitters get the day off work, or their husbands do so they can watch the kids, and the knitters get to meet somewhere and knit all day long!! What an adorable banner!! 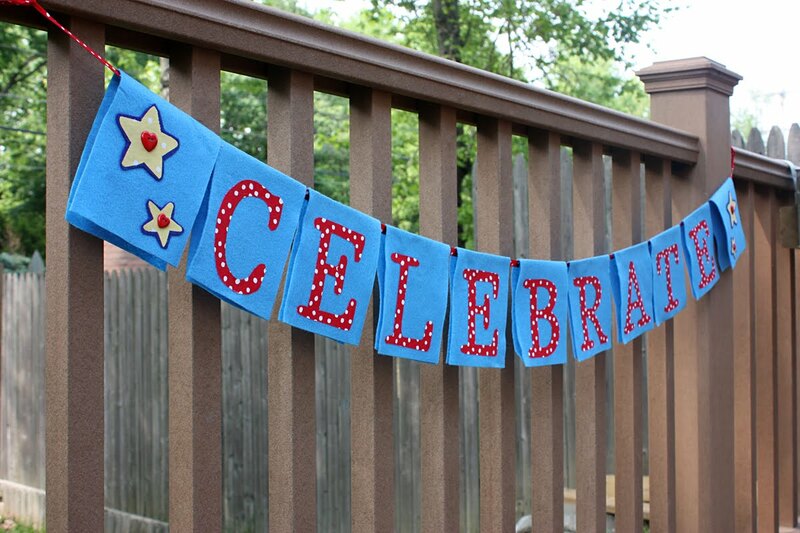 There are so many things in our lives that deserve a celebration. I want my holiday to be about Families, how lucky we are to have each other. I think I would like to celebrate "Dad Takes A Random Day Off Of Work Day" Followed by "Mom Takes A Nap While Dad Is off of Work Day." Thanks for the chance to win! I would love a "Read all day on the porch while sipping lemonade and eating chocolate day!" Bliss! I'd celebrate: getting home after a long trip! I would celebrate "Finding Money in Your Pocket." Isn't it great when you find five bucks in your jacket pocket from last season?? The banner is great and my favorite color combo! Thanks for offering it. I would celebrate a Sleeping in Day--or a Don't Have to Clean at all day!! How about "My Husband Made Dinner, Did the Dishes, and Wiped off the Kids' Faces All in One Day" day? i love this banner! I'd celebrate a day at the movies! All day long spent watching your favorite movies with all the essential movie snacks! That would be perfect! I would celebrate the nights that both of my daughters go to bed quickly and without a fuss! It happens so rarely that it definitely warrants celebration! I would celebrate good health, german shepherd kisses (or any animal kisses for that matter), and relaxed days full of creative outlets! I would make a holiday - I've had all my dental work done!!!! I'd have a holiday that celebrates relaxing on the porch and chatting with friends and loved ones. Hmm..I would probably have to celebrate sunshine and oatmeal- two of my very favorite things! I love your banner! It's very cheery! I would celebrate every day as a "birth" day with baby showers (including petit fours-yum! ), flowers being sent, and snuggly little babies to kiss and hug! Adventures... Whenever we are in the car and lost or something else is not quite right, we always make it fun by saying, "We're on an adventure!" I would love to have a "Read a book" day where it would be expected that everyone spends the day in quiet lounging and reading a book! I never get any time to just lie around and read. I love the banner! I would celebrate no dirty laundry day! A day in which I am not washing clothes and no dirty clothes are created for me to have to wash later! haahaa! I'd like a day to celebrate people who we are blood related to, but who we love like family. i'd have a celebrate pizza day.. I'd celebrate "Someone other then mom put on a new roll of Toilet paper and flushed the potty" Day!! Were mom's all around the world would get their bathrooms sparkly and wouldn't have to lift a finger to do it!!! Could we have a celebrate good food day? Or maybe a celebration of the garden? Hmmmmm, holiday that's hard. My husband and I are currently trying to instill date night once a week. I do think that's important to maintain your relationship! Thanks for the giveaway. I love felt! i think there should be a "sewing holiday" a week to do nothing but sew... but where the house would not ex/implode while you are doing it! I actually participate in the Odd Holiday swaps on Craftster! They are great! I even make up calenders with the odd holidays on them, I'm a nerd, I know, but I find it gives me inspiration with my 2 young kids. My personal favorite so far has been "Something on a stick day" which I forgot to get stuff for in March so we are moving to my bday in June because why the heck not? I see you like frugal fun activities with kids? Send me your email and I'll send you the June calender when I get it up! Don't miss my unofficial giveaway! I would love a "no cleaning, no chores, only sewing or other hobbies day." Wouldn't that be soooo nice??? Love this little banner! It's so sweet! It would be great for my daughter's 2nd b-day in the fall! Thanks! 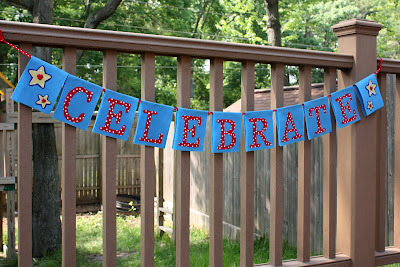 The banner is sooo cute and could be used at so many parties!! Ihope I win! I would like to celebrate Universal Humanity Day, or World Peace Day. Cute! I'd go with Girly Fun Road Trip -- where there would be free and willing childcare, time off and loads of fun to be had! I would have Read Your Favorite Book Day! If I could make a new holiday it would be a mandatory family fun day! My house is always a mess but our family has a ball doing things together and I know alot of people dont get down on the kids level and really enjoy them. Would love to win, we all have a lot to celebrate! How about, I'm Alive Holiday! i would love to win this! a bunch of birthdays are coming up beginning with my grama's 94th at the beginning of june... then mine, my husband's, my mom's, my daughter's. i want there to be a holiday of the vacation sort, where someone comes to watch my daughter while i make a large-scale project like a quilt. i want international free guacamole day, walk in the woods day. random acts of kindness day. mix-up day. interview-a-stranger day. visit somebody in a nursing home day. I would like to celebrate adoption day as we are waiting for a new little grandchild to join our family. When we were kids, my parents had a red plate that was used to celebrate everything from birthdays to an A on an important test. I want to do the same for my son and husband. Celebrate life's small successes! I would celebrate sisters day as my sisters are my best friends. Cute stuff! That would be perfect for birthday parties! Speaking of birthdays, I would change it from birth day to birth week, celebrating all week long! I would have calorie free chocolate day! Holidays always get so busy and crazy, they end up being a time of stress for people. So I would make a holiday were you can't plan a head, but instead enjoy the day in the moment with what you have on hand. I would like to see a sibling day just for siblings to get together and share the love! I would celebrate FAMILY DAY! CUTE! I like your kindness cards, too. Great idea! I would dub a new "pie for breakfast" holiday. Elves bake and deliver the pie to our tables, of course. Yes, I love sleeping in day! I would create a sibling day--where you just get to hang out with your brothers and sisters for the afternoon! I think I would celebrate Ice Cream for Dinner day! I rmember when I was a kid my Mom would do this sometimes and it was always so wonderful! I would love to have a gardening day. Great banners! I would love to have a 'Mommy's day off day' where I can just do what I want to for a whole day with no responsibilities. How about, once a month?? I'd spend the day reading, crafting, swimming......sleeping. Cake day - a day to eat cake for absolutely no reason other than I want to. I think it would be nice to have a sewing day. to celebrate all crafters. I would celebrate Family Day. No cell phones allowed family time. I would celebrate the first day of planting. Have a little yard party, everyone trade plants ready to go into the ground. It'd be awesome! I would turn the first day of spring and the first day of summer into holidays! How much fun would bbq's poolside be, or having a party to do some garden planning? I would invent International Childhood Day (I know in Brazil they have Children's day, I don't think we have anything like it in the US). We'd celebrate childhood, and everyone could have the day off to go have fun with their families. by the way, I am new to your blog and I just took a browse around and I loved that you delivered twins at home (over 7lbs each too! That is amazing...high 5 to you. I delivered my 2nd son at home, but the 1st and 3rd were both at the hospital because insurance pays for it...bummer, but we'll save so we can have more homebirths. Out here in CA it is $4000, out of pocket, I loved having a homebirth though...a lot of people just don't understand how wonderful it is). National Coca-Cola Day. Tragic but true. Best Friends Day. A day where you celebrate your friendship with your best friend. Love the banner! I would create a holiday called every Sunday someone gets breakfast in bed. Maybe I will incorporate that in my house! National Barefoot in Warm Sand Day! I would have a holiday for hammocks and seedlings. I really love both. My holiday would be "No wining or crying day". Terrible twos are driving me crazy! Love the banner! I would create a Pie Day! I love Apple Pie personally, but I think life is so much better with a little pie! I love this banner! I think I would have a "Just take time to love your family day" All too often there isn't enough time in the day to just enjoy the small things with little children. So I would just take a whole day to do, and play and laugh about whatever we wanted. I would love to celebrate, we're going on a date tonight! No kids no responsibilities just me and my hubby. I think that would be fun. my love language is food, and my favorite part of holidays and traditions is always based around what we eat. I think I'd love a fondue day, or an oriental food day, or a comfort food day. I love your banner! I think a picnic day would be great fun--everyone would do a potluck picnic, lots of games, etc. Thanks for the giveaway! I love the banner. I'm a mama to 5 also (all boys though!!!) I would love a crafting day holiday or a garden day holiday or a Dad-plans-and-cleans-up-all-the-meals holiday!!! I would celebrate RAOK day, a holiday about giving. On RAOK day, everyone should do at least one Random Act Of Kindness for someone else, preferably a perfect stranger. Something as simple as holding the door open for someone with their hands full to paying for the guy behind you at the drive through. Just a little something, totally unexpected, to brighten someone's day. This banner would be great for one of my DILs who entertains ALL THE TIME FOR ONE REASON OR ANOTHER!!!! And then, they just had their 5th child, so lots of birthdays in the years ahead to celebrate. If I could invent a something to celebrate...I think I would like a month of solitude. I like my peace and quiet and the noise of this world and it's gadgets grates on my ears!